It’s our last tour for the Modern Cabin on the Lake!!! We revealed the webisode and first photo tour last week, and today we’re showing you the bonus rooms. 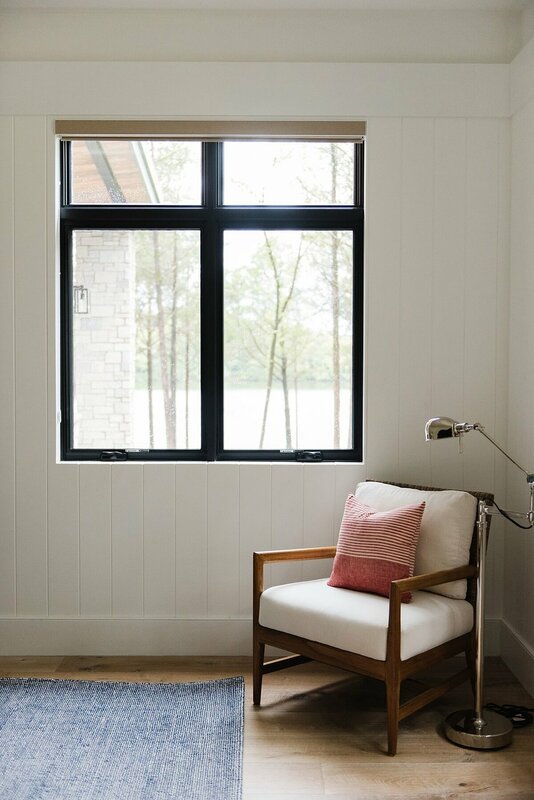 This cabin is definitely influenced by the beautiful lake surrounding it, and we carried natural tones throughout the home. 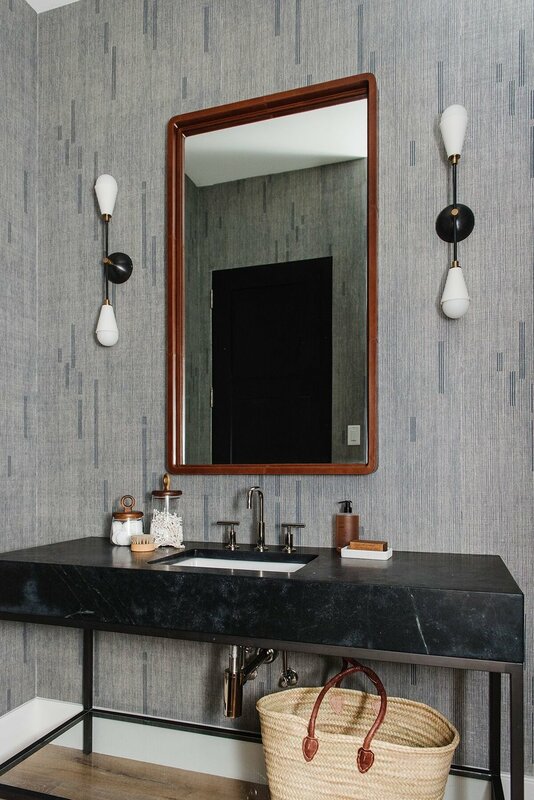 We softened the black in the bathroom with warm wood and polished nickel. The beautiful veining in the marble doesn’t hurt either! We did vertical paneling on the walls of the guest bedroom. The color palette is primarily blues and whites, with warm wood. Our Matrix Rug is an ideal decor choice, because it can be dressed up or down. 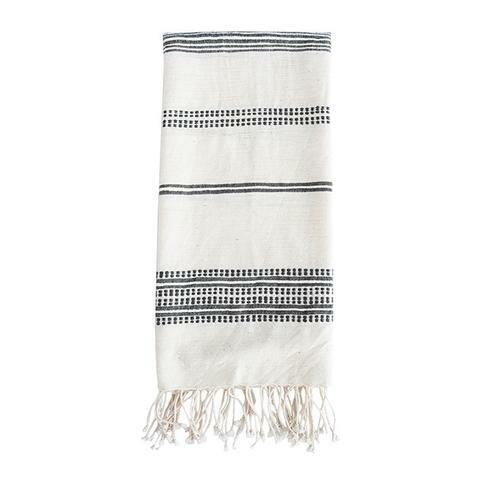 With a strict grid pattern in navy, it’s bold but subtle and versatile. The tufted wool makes it comfortable in a bedroom space! We love to make guests feel cozy and at home. This textural lamp has the coolest shape and texture—we’re always excited to use it in projects! This bathroom is rich and moody, with dark chic details that we just love. The wallpaper is really cool, with subtle texture that nods to the outdoors. 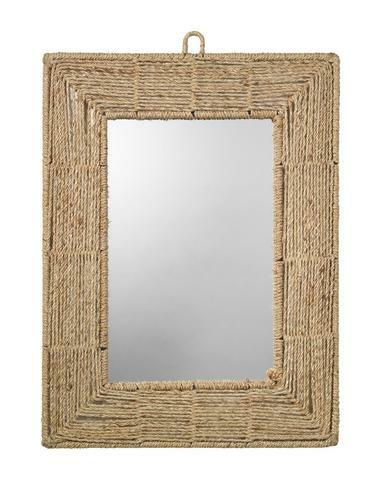 This chic mirror is covered in tobacco leather, making it contrast against dark spaces beautifully. Last but not least we have a little kitchenette off the entry in the cabin! We kept it simple but were sure to create warmth with a vintage rug! !